Inspector general's office officials say they can't weigh in on the certification. House Republicans today used a hearing on public health insurance exchange eligibility review procedures to attack the credibility of Obama administration officials. 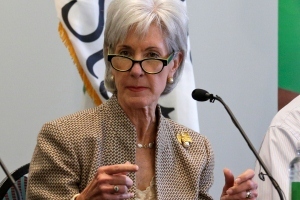 Lawmakers questioned whether Kathleen Sebelius, the former secretary of the U.S. Department of Health and Human Services (HHS), was correct on Jan. 1, 2014, when she certified that the Patient Protection and Affordable Care Act (PPACA) had an income and subsidy eligibility verification system in place, and whether HHS has an effective eligibility verification system in place today. Rep. Morgan Griffith, R-Va., tried to get Kay Daly, an assistant inspector general with the HHS Office of Inspector General, to give him her views on the current status of eligibility reviews for the consumers applying for private qualified health plan (QHP) coverage through the HHS-run exchanges. Daly said HHS OIG looked only at exchange user eligibility inconsistency reviews for the period from Oct. 1, 2013, through Dec. 31, 2013. Griffith also tried to get Daly to tell him whether she believes Sebelius was correct when Sebelius certified that the exchanges had an eligibility verification system in place in January. “I really can’t respond to that,” Daly said. Republicans inserted a provision requiring the HHS secretary to certify that the exchanges had an eligibility verification system in place for applicants for PPACA qualified health plan subsidies in the 2014 Continuing Appropriations Act. President Obama signed H.R. 2775, the bill that created the law, on Oct. 17, 2013. HHS OIG officials concluded in a report released earlier this month that, during a period from Oct. 1, 2013, through Dec. 31, 2013, they believe inconsistencies between various sources of information about HHS exchange users had occurred 2.9 million times, and that the HHS exchanges had resolved only 2.6 million of the inconsistencies. Griffith and other Republican lawmakers at the hearing argued that the large number of inconsistencies shows that HHS has not yet set up an effective eligibility verification system. Democrats at the hearing said enemies of PPACA continue to try to tear down the exchange system without having any genuine interest in improving the exchange system.